The School’s Annual Fund is open for the 2018-2019 school year. 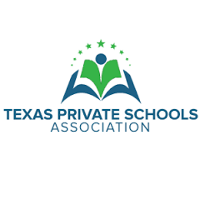 While there are always financial goals in mind, the most significant measure of our success for this year’s fund will be achieving 100% participation from St. Thomas families, staff, and board. Expanding our Spanish Language program to a bilingual model, where students attend daily Spanish classes for both language instruction and reinforcement of other academic skills (math for example) en español. Increasing our use of Project Based Learning to engage students in authentic learning experiences that combine multiple academic disciplines and skills. Continuing technology integration into our curriculum to teach students the necessary computer skills for the digital age through programs like MIT’s early coding program Scratch, and expanding our use of Google Classrooms. STEAM (Science Technology Engineering Arts Mathematics) integration into core curriculum through projects, and arts integration. Growing our music program by establishing a performance choir that will sing at school and community events. This is the first year we will be presenting a school-wide Christmas concert (Christmas Around the World!) where every student in every grade level is learning a song that they will sing as a class, including songs in Spanish. On campus, we are building The Studio, an open-concept multi-purpose room with lab and arts equipment that will support the STEAM curriculum and accommodate the special community feeling unique to our School. This year, a main object of Annual Fund giving will be to enable budgeting for these initiatives. In the School’s scheme of fund raising, the Annual Fund is the most visible to various grant agencies and our accreditation board, who look for participation statistics among our families. The School Board and staff have both committed to 100% participation, and are encouraging each family to participate, at whatever level you are able. 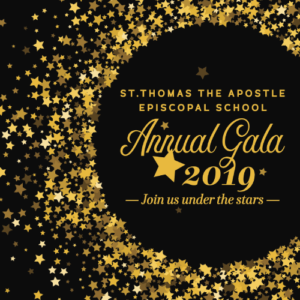 If you are a local friend of the school – a graduate, graduate’s family, St. Thomas parishioner, or another local friend – then this request and the School’s annual gala and auction will be your main opportunities to support the School this year. If you are an out of town friend of the School, this will be your main giving opportunity. We believe the Gospel calls us to have open, inquiring and loving minds and hearts to explore the physical universe and the world of many peoples – and we want to be able to invite children and families of all backgrounds to share and enrich the education we offer. Any time in history is a good time to have a fearless love of learning; perhaps now is an especially good time. Every bit of what you provide will be used for these scholarly, holy purposes. We’re grateful for the wonderful support given the School for so many years. We hope you will prayerfully consider this opportunity. 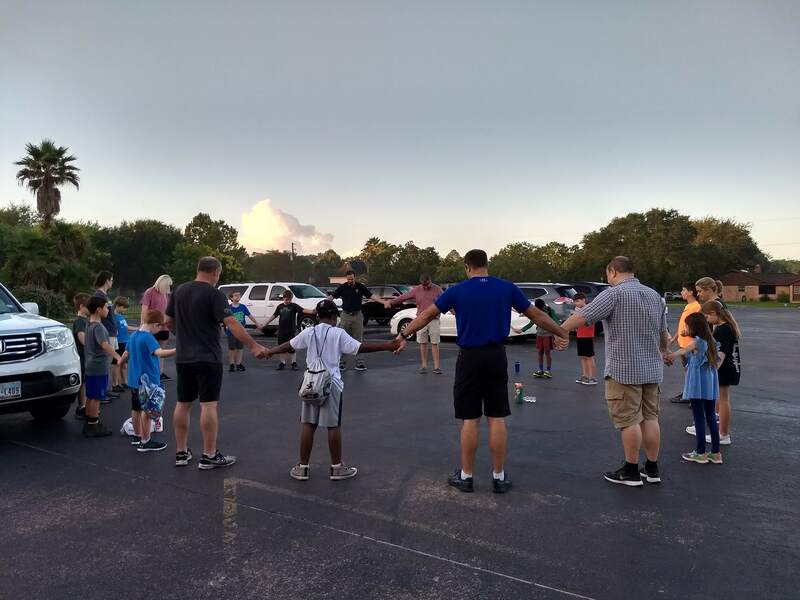 Upper elementary prays together as they set out for Camp Allen.